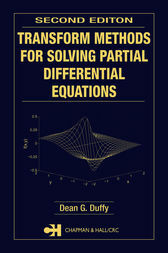 Transform methods provide a bridge between the commonly used method of separation of variables and numerical techniques for solving linear partial differential equations. While in some ways similar to separation of variables, transform methods can be effective for a wider class of problems. Even when the inverse of the transform cannot be found analytically, numeric and asymptotic techniques now exist for their inversion, and because the problem retains some of its analytic aspect, one can gain greater physical insight than typically obtained from a purely numerical approach. As reflected by the book's organization, content, and many examples, the author's focus remains firmly on applications. While the subject matter is classical, this book gives it a fresh, modern treatment that is exceptionally practical, eminently readable, and especially valuable to anyone solving problems in engineering and the applied sciences.